K5CM OK Good signal tonight Marvin. Thanks for doing the WC run. K6APW CA The 80M a few dB over S6 noise both 40M nice S7 to S9+ though WC had a few very deep dips. K6OQK CA There was quite a bit of Doppler on all signals including Marv's. Your 40-meter signal was quite good but 80-Meters was weaker than normal. Tonight was one of chaos in my shack. Thanks to you and Pam for great FMT's. K6YAZ CA Poor conditions and problems with getting SL to start caused no readings on Connie; 40 meters quite spread out by Doppler. Used marker on W6OQI and measured offset using delta frequency function. Good signal from him; but he isn't very far from me. KM1P MA Went for 40M only this time - just like last night; but I found that I got better results trying to measure on the correct evening! Signal was fine; but a central peak in the FFT was tough to discern. N5PWG TX Thanks again for all that you are doing. I really enjoy the activity. All signals good tonight. N8OB OH I got home at the last minute so equipment was not warmed up. This is a very interesting way to measure. VE3OAT ON I briefly tried to measure the B-A beat note in AM mode but the poor low frequency response of my receiver seemed to prevent it. I will play with that some more. The straight RF method always works though. 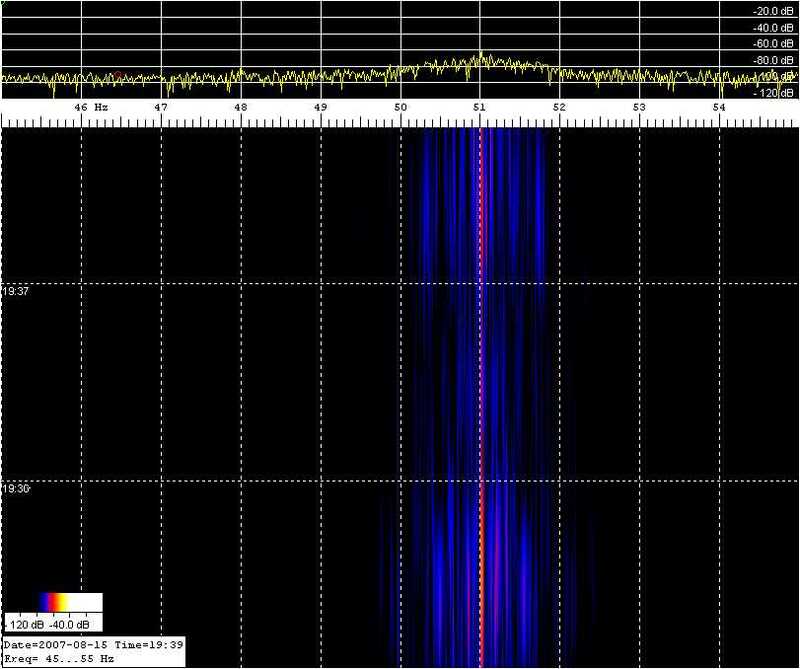 Doppler shift was pretty stable around 250 Hz. W6OQI's signal was weaker in the se this time but I think I got a fair average reading. Thanks again for a "fun run". W1PW AZ No measurements yet on 2-tone. Trying to figure a way by using "dual receive" function in the 756-ProII. W3CSW MD Thanks again Connie Good signals but bad Doppler. W3JW VA Signal strength conditions were average to above average and QRN was less than in most recent tests. Doppler effects (as observed on the SL waterfall display) were significant but not as severe as during tests in the July time frame. Most results were obtained with SL. W6OQI CA Connie; I was able to get Spectrum Lab running OK in the late afternoon. I set the span for 60 Hz starting at the HP3586B I.F. and extending 60 Hz below. During the 80 meter FMT I recorded the .wav file and analyzed it later using the SL Delta function to come up with a difference of -50.888 Hz. Due to the conversion scheme of the HP3586B I had to add this to your A frequency to determine your B frequency. Bill, W3CSW hit the nail on the head with his uncorrected reading. Burt (K6OQK), Jacques (VE2AZX), and Jeff (W3JW) turned in very close "corrected" readings. Stations copying K5CM run to .1Hz or better uncorrected. Stations copying K5CM run to .1Hz or better corrected. Stations copying K5CM 40 meter run to .1Hz or better. A HP-Z3801 GPS clocks a HP-3336B and a PTS-250. A small 10 db transistor amp follows and drives a 12BY7 / pair 6146. Then to the final amplifier, a Drake L4B at 300 watts output except on 30 meters where the power is 75 watts. There are no mixers or any device in the chain of amplifiers that might impact the accuracy of the HP-Z3801. As a reality check, I periodically log the HP-Z3801 against WWVB.